BKO: Bangkok Knockout: Ever since Tony Jaa hit the Asian film scene, ramping up martial arts movies with the energy and intensity that hadn’t been seen since the early days of Jackie Chan, Thailand has been the country to watch for innovative and brutally violent movies. Though there have been very few highlights such as Chocolate and Tom-Yum-Goong, there have been many low-budget attempts to cash in on the craze as well, showing that the director is (sometimes) more important than just action scenes. I’m not 100% sold on this film as it’s directed by Panna Rittikrai, who was behind The Bodyguard (comedy farce) but also Born to Fight, and Ong Bak 2 & 3. I considered the film a gamble, but then I watched the trailer and read the description that NYAFF has up on their site: “Did that guy just fall 50 feet onto concrete? Did that dude just get set on fire? When are they going to put him out? Did those guys just perform a fight scene underneath a moving truck? !” This is essential to why I love Asian cinema. Karate-Robo Zaborgar: Now over to Japan, where really exciting and insanely bizarre (and utterly disgusting) things have been happening in movies in the last few years. The cult figures of this new era of Japanese Gonzo Grindhouse are Noboru Iguchi (director/writer of The Machine Girl, RoboGeisha, & Mutant Girls Squad) and the company Sushi Typhoon, which has released modern classics such as Alien vs Ninja, Helldriver and Yakuza Weapon. The Machine Girl is the movie that made me stand up and take notice of what Japanese filmmakers are doing besides the craziness that director Takashi Miike brings to the table each year. And even though RoboGeisha didn’t live up to the absolute brilliance of its trailer, this is a take on a superhero transforming robot motorcycle! Forget everything else I said and focus on that! Reign of Assassins: It was really hard to pick an essential third film to see as there’s a lot of newer material that looks intriguing (Ninja Kids!! !, Shaolin, Milocrorze: A Love Story). But, I’m also really itching to see an old school Hong Kong flick up on the big screen like The Blade, Dragon Inn, Zu: Warriors From The Magic Mountain, Riki-Oh: The Story of Ricky, Duel to the Death. I highly suggest seeing any and all of those, though you can come by my place whenever and I’ll bust them out of my HK DVD collection. In the end I had to go with my girl, the Queen of Kung Fu, Michelle Yeoh and Reign of Assassins. This fantasy wuxia film promises to have a fair amount of depth and emotion to it. Michelle has let me down in the past (Silver Hawk, The Touch), but her hits far outweigh her misses. Plus, this is one of the few Taiwanese films at NYAFF, and if this festival’s growth is any indication, more Asian countries putting out more international hits means great things for fans of Asian cinema. It’s the time for NYAFF again, and I couldn’t be more excited. Why, you ask? Because no one does perversion and gore like the Asians! Horny House of Horror: A Japanese film featuring many of the country’s most famed adult film actresses playing sadistic workers at a “massage parlor” looks to be delightfully dark and funny. Also, as one of the premiere films, it features a boozy pre-screening party! Foxy Festival: The trailer for this Korean film leads me to believe that it might be in the running for one of the most hilariously perverse movies in existence. 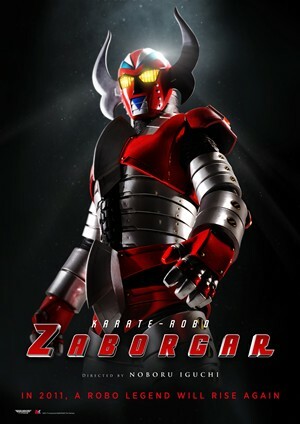 Karate-Robo Zaborgar: This is the movie I am anticipating the most highly. Directed by Noboru Iguchi (RoboGeisha and The Machine Girl), it’s almost guaranteed to be my favorite. How can you not love the director that put tempura frying a teenage girl’s arm onto glorious celluloid? Horny House of Horror: Splatter effects by Yoshihiro Nishimura. I remember hanging out with this man after the premiere of Vampire Girl vs. Frankenstein Girl. He was wearing a winged skull on his head. The man is a genius and should be respected as such. The Last Days of the World: Could this be Japan’s answer to The Doom Generation? Will Kurt live tweet his way through Karate-Robo Zaborgar? Find out here! Peter will most likely be making passes at Asami on Twitter. Will it work? And while you’re at it, don’t forget to take a look at the official NYAFF website and make your own list of this year’s unmissable films!